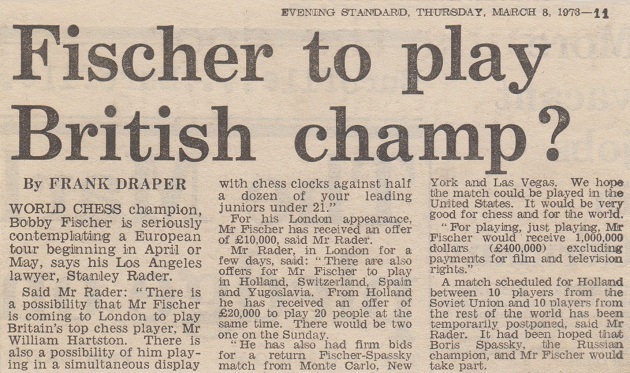 The players are Neil Carr (4 January 1977), Julian Hodgson (11 May 1974), Simone Leberman (7 January 1974), David Norwood (1 August 1977), Nigel Short (28 December 1977, 30 December 1977 and 3 January 1978) and Jonathan Speelman (12 December 1972). 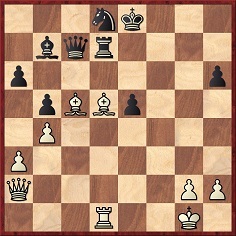 After 31 Be2, was Black justified in resigning? 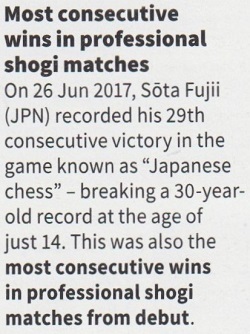 The English Chess Federation’s webpage ‘Book of the Year 2018 shortlist’ miscopies one title, transforming Karjakin into ‘Kajarkin’. 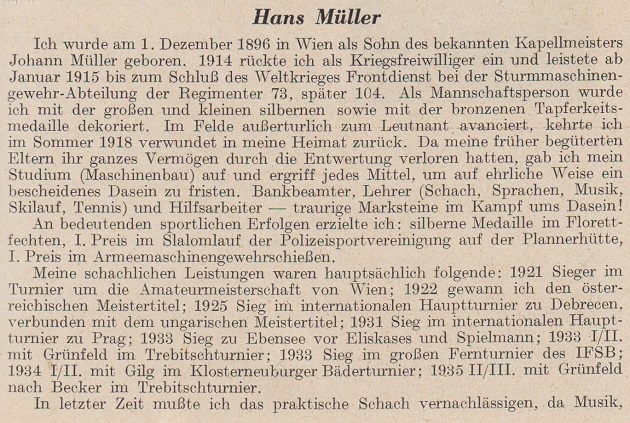 (A panel member’s personal webpage goes further, with ‘Kajarkan’.) 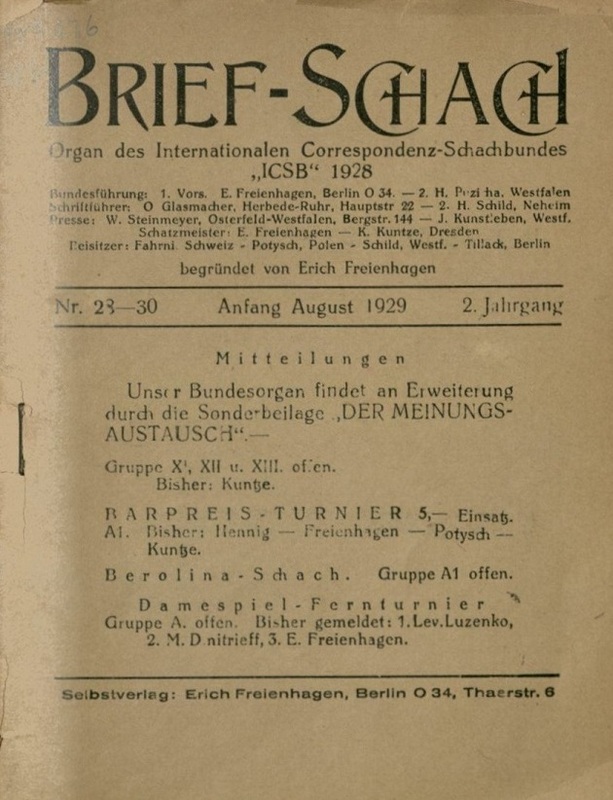 Nothing is disclosed about the contest’s conditions, such as eligibility in terms of date of publication, or about the three judges’ imagined credentials. 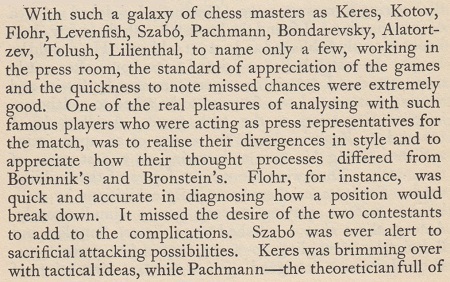 The inclusion of S. Tkachenko’s book on Alekhine indicates that proper historical standards are not a requirement. 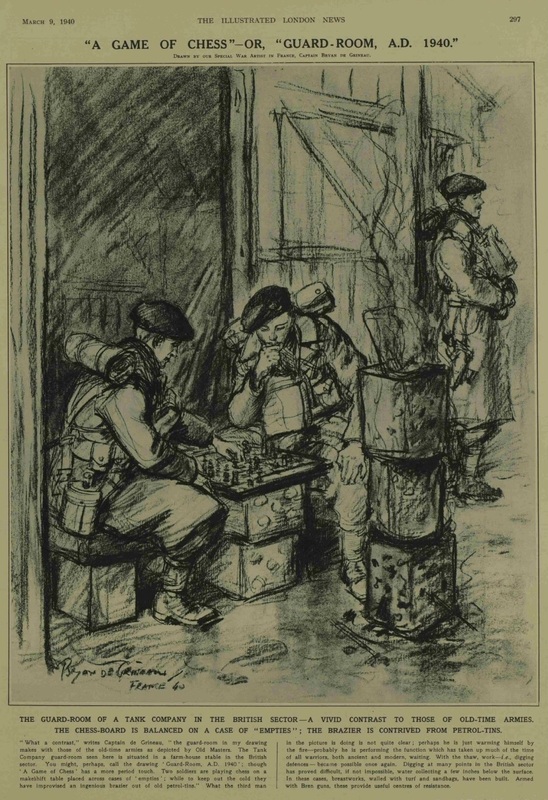 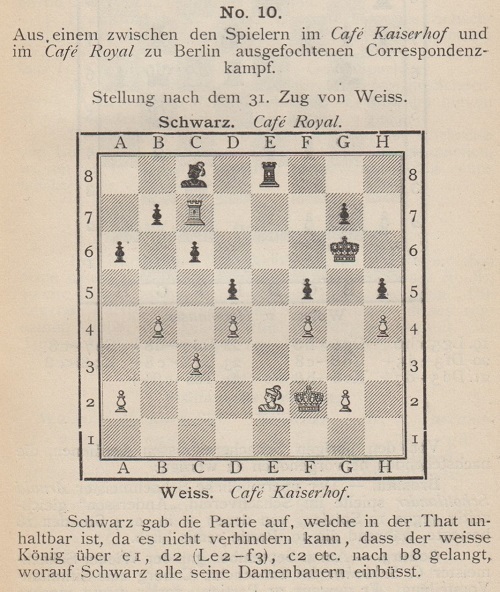 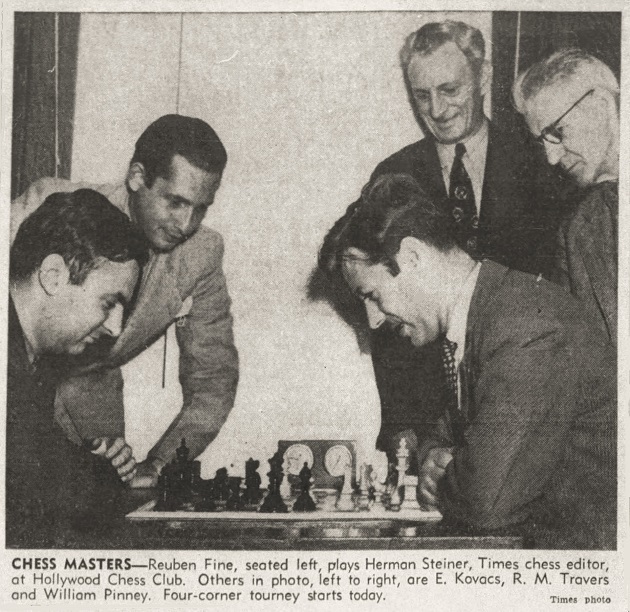 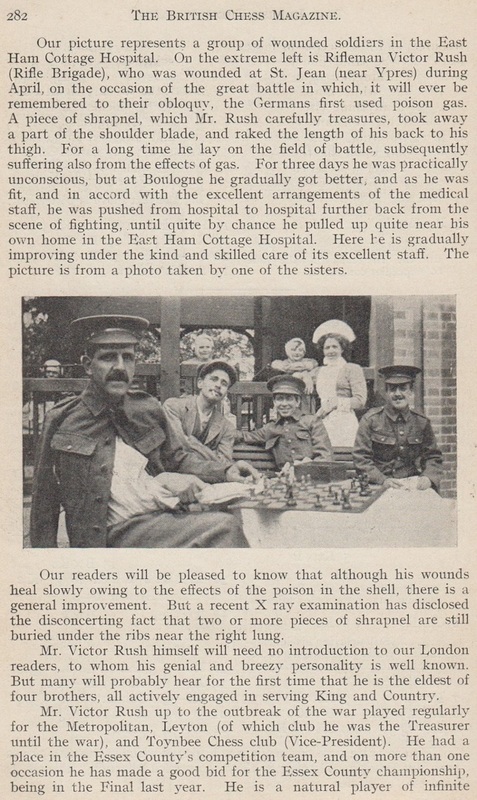 The picture was reproduced on page 161 of CHESS, April 1940. 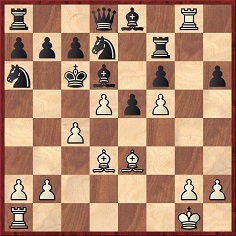 After 31 Be2 Black resigned on the grounds that a decisive march by the white king to b8 is unpreventable. 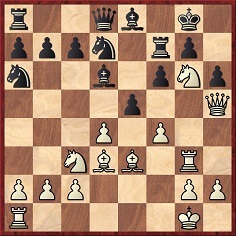 1 e4 e5 2 Nf3 Nc6 3 Nc3 Nf6 4 Bb5 Bc5 5 O-O O-O 6 Nxe5 Bd4 7 Nf3 Bxc3 8 dxc3 Nxe4 9 Re1 f5 10 Bc4+ Kh8 11 Bd5 d6 12 Nd4 Nxd4 13 cxd4 Nf6 14 Bg5 h6 15 Bxf6 Qxf6 16 Qe2 c6 17 Bb3 Bd7 18 Qe7 Rad8 19 Qxf6 Rxf6 20 f4 Rff8 21 Re7 Bc8 22 Rae1 d5 23 Rc7 Rd7 24 Re7 Rxc7 25 Rxc7 Rd8 26 h4 h5 27 c3 Kh7 28 Bd1 Kg6 29 b4 a6 30 Kf2 Re8 31 Be2 Resigns. 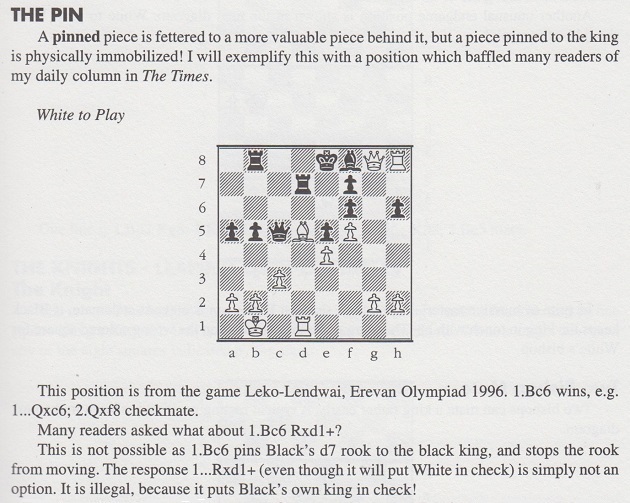 The reference to ‘blindfolded’ in the heading is not to be taken literally. 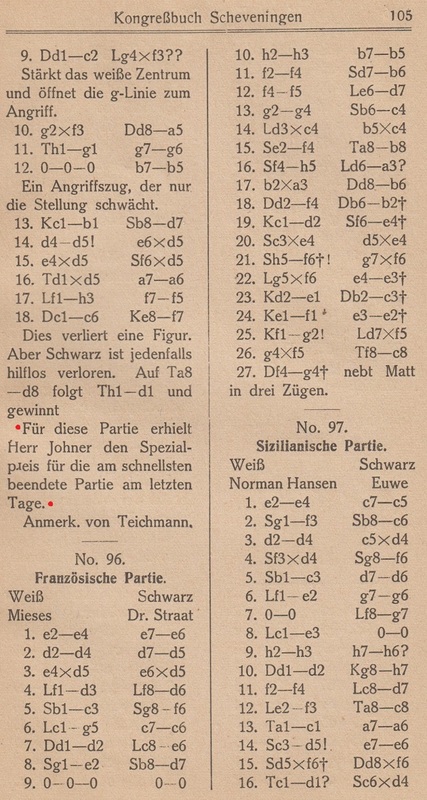 Regarding the number of games played, a chart of Alekhine’s exhibitions in Canada and the United States from November 1923 to April 1924 on page 154 of the July-August 1924 American Chess Bulletin specified 32 (+24 –3 =5), figures also given on pages 217 and 771 of the Skinner/Verhoeven volume on Alekhine. 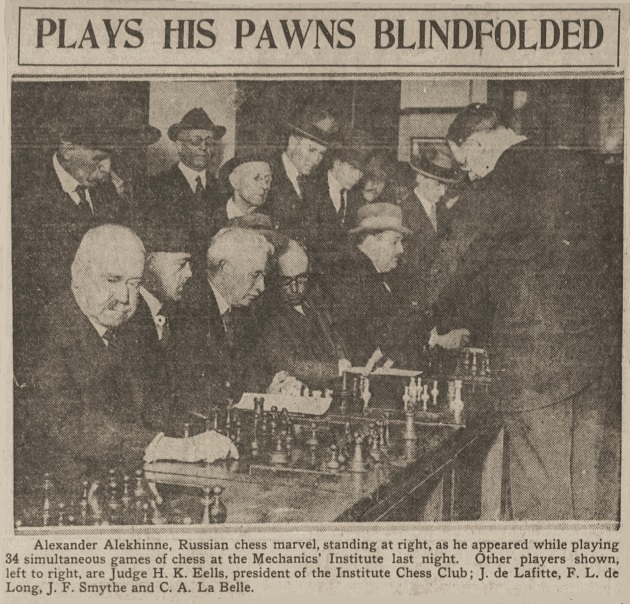 The full chart was reproduced on page 3 of Alekhine in the Americas by J. Donaldson, N. Minev and Y. Seirawan (Seattle, 1992). 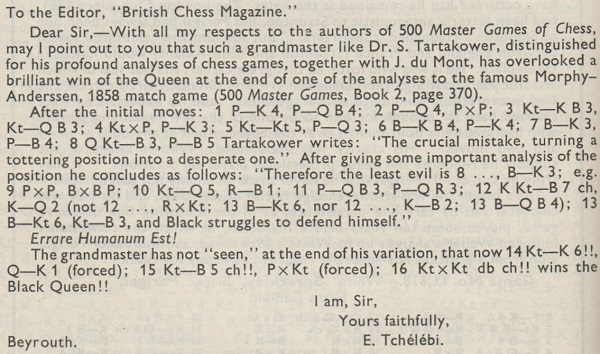 The phrase ‘according to Chess’ takes the reader nowhere. 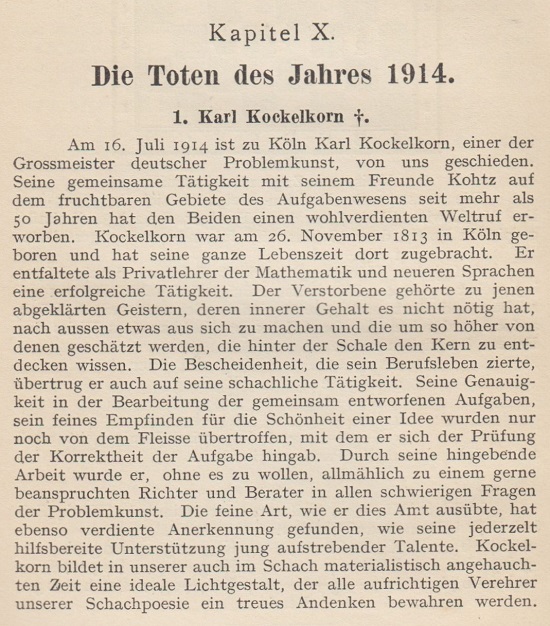 Krejcik states that his hosts had induced him to drink alcohol before the exhibition but places the performance at Whitsun (zu Pfingsten). 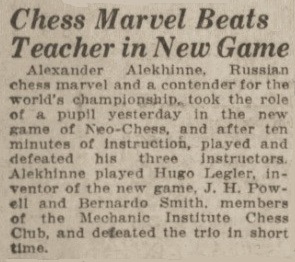 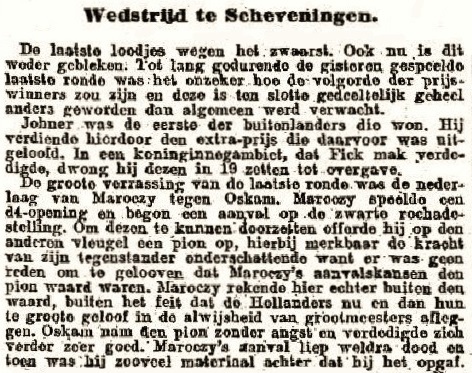 That undermines the ‘worst birthday present in chess history’ claim, given that he was born on 22 January 1885. 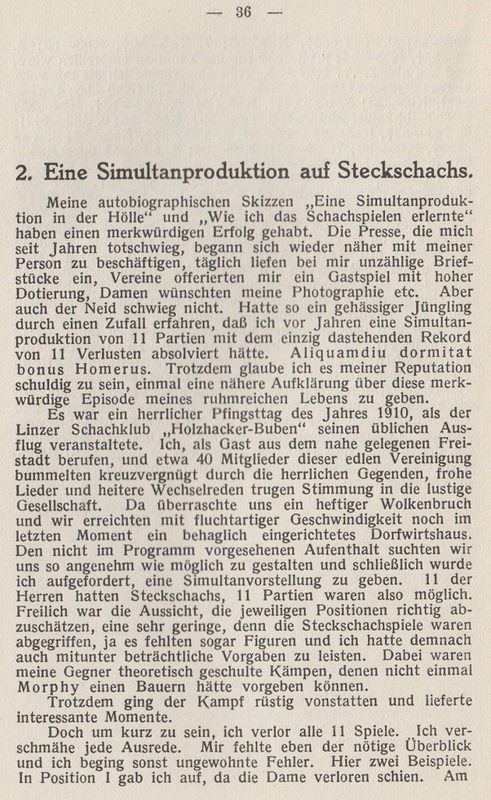 Can information on the display be found in any 1910 publications? 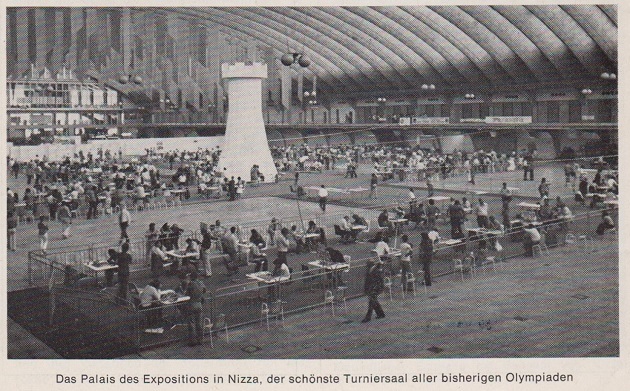 Regarding poor results in simultaneous exhibitions, see too C.N. 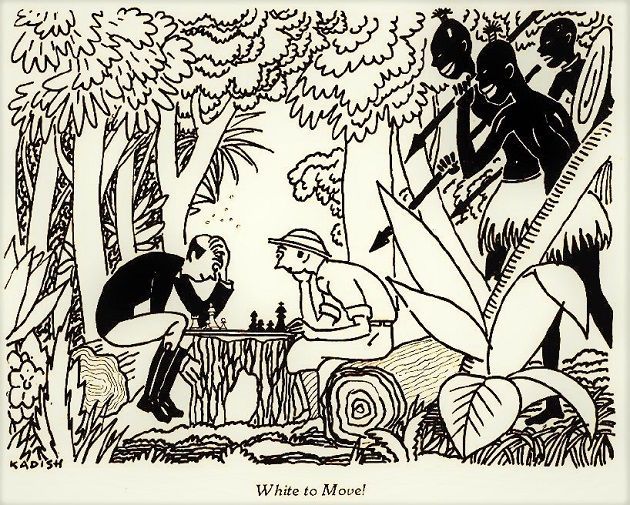 2816 (on page 71 of Chess Facts and Fables) and C.N. 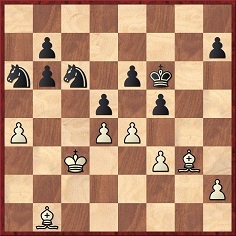 6451. 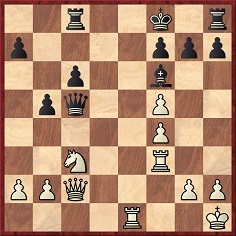 21...Nc8 22 Rab1 Bxa3 23 Rb7 Nb6 24 Nxd7 Nd6 25 Nxb6 axb6 26 White resigns. 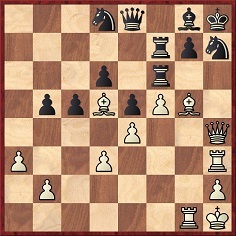 14 d5 exd5 15 exd5 exd5 16 Nxd5 Nxd5 17 Rxd5 a6 18 Bh3 f5 19 Qc6 [Kf7 and Black resigns]. 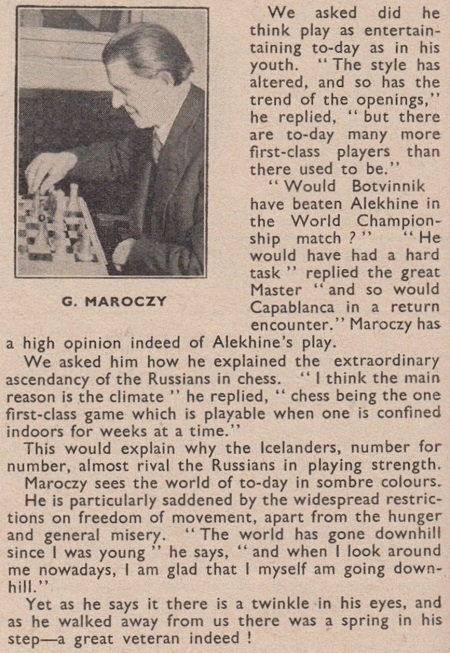 The question has been put to Arkady Dvorkovich by Macauley Peterson in a ChessBase interview. 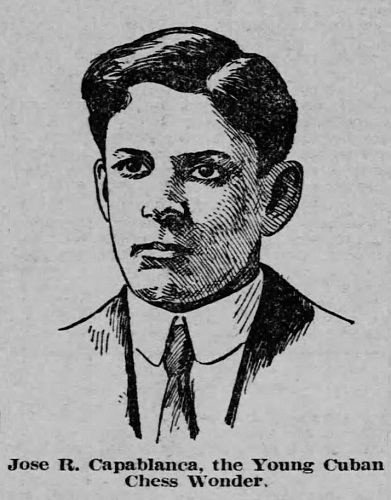 C.H.O’D. 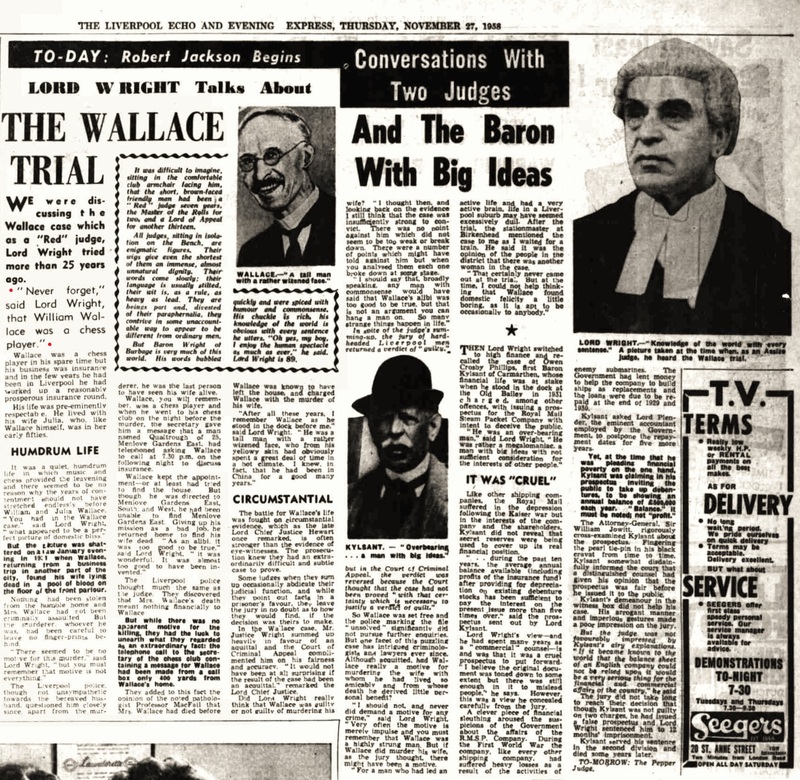 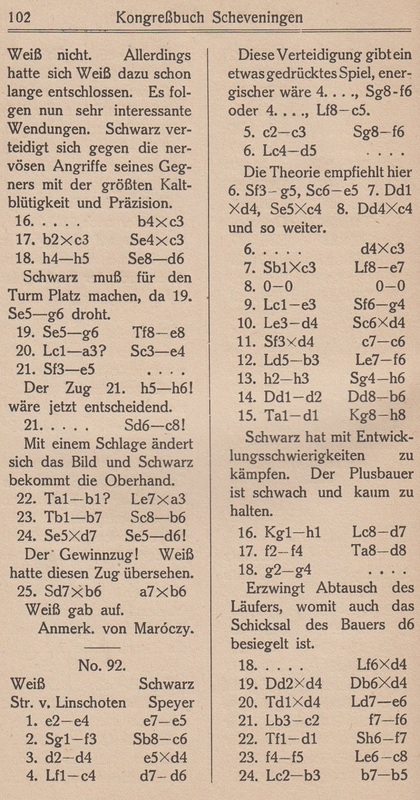 Alexander, BCM, July 1955, page 216. 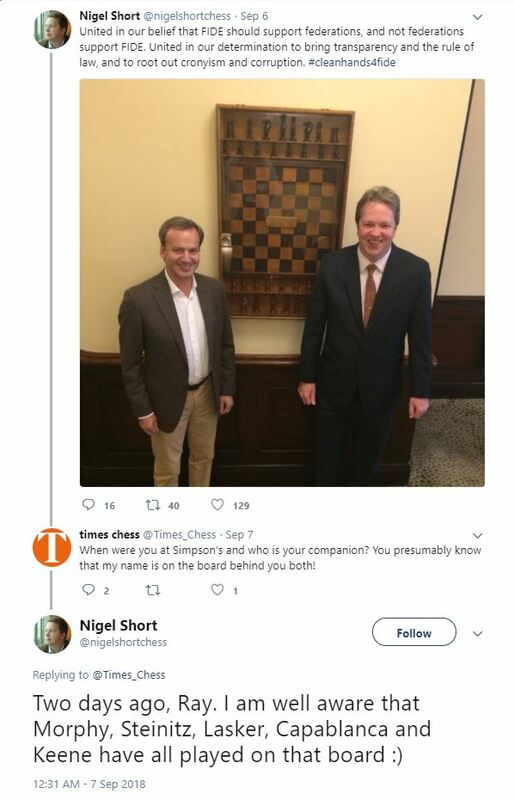 This position will be discussed in the next C.N. 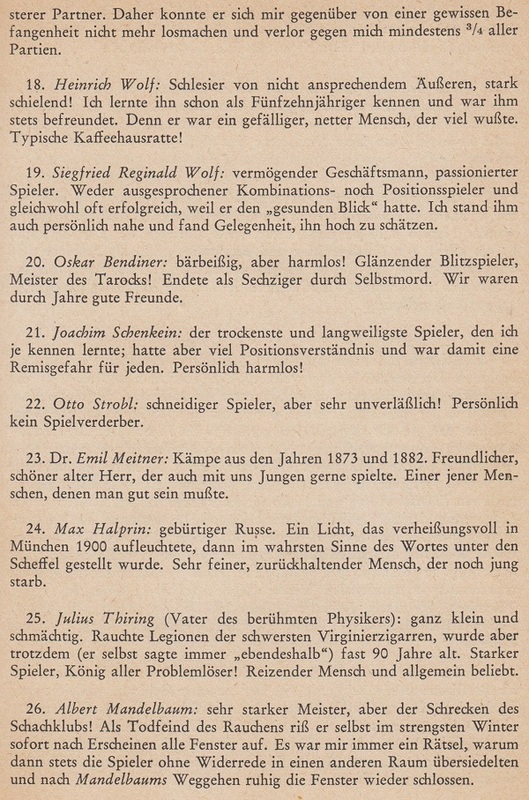 item. 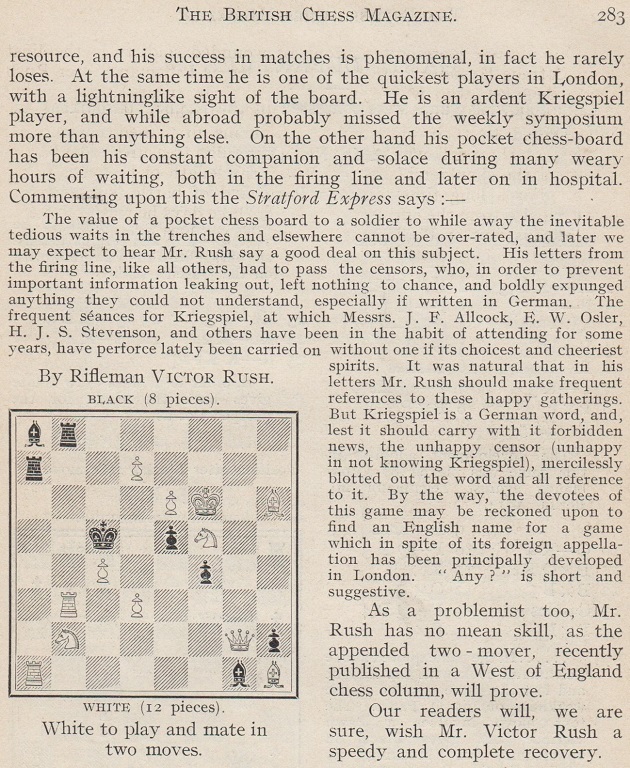 Rush lived until 1951, and a brief obituary is on page 118 of the April 1951 BCM. 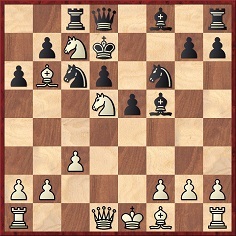 Mate in seven: 1 Qxh6 gxh6 2 Ne7+ Kf8 3 Rg8+ Kxe7 4 Nd5+ Ke6 5 f5+ Kxd5 6 c4+ Kc6 7 d5 mate. 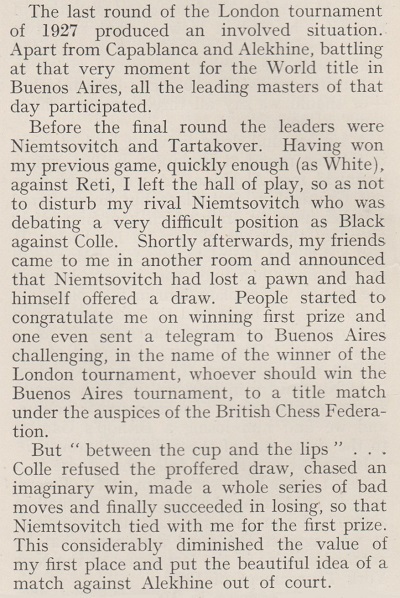 In the first paragraph, the word ‘previous’ is inapposite; Tartakower v Réti was the last-round game. 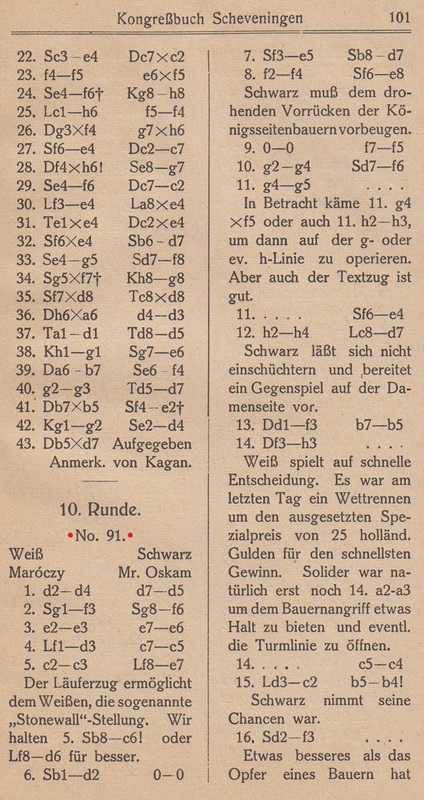 Against Colle, Nimzowitsch was White, not Black; he annotated the game on pages 73-76 of Die Praxis meines Systems (Berlin, 1930). 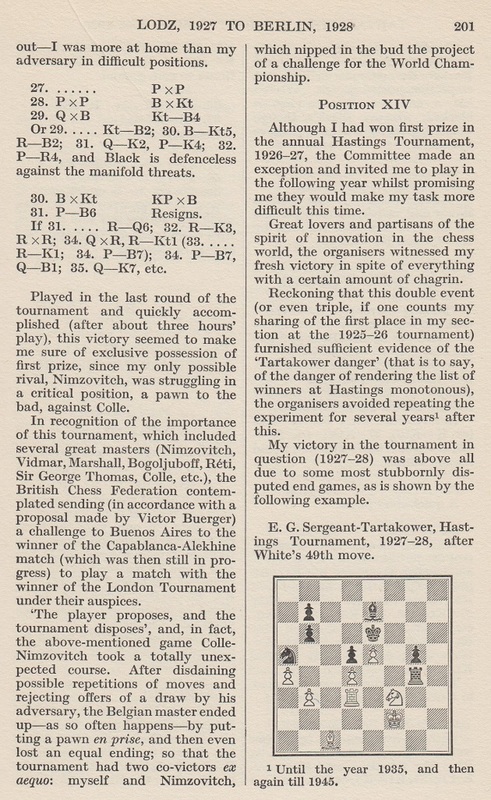 Having annotated his win over Réti, Tartakower discussed the aftermath of the London, 1927 tournament on page 201 of his first volume of Best Games (London, 1953). 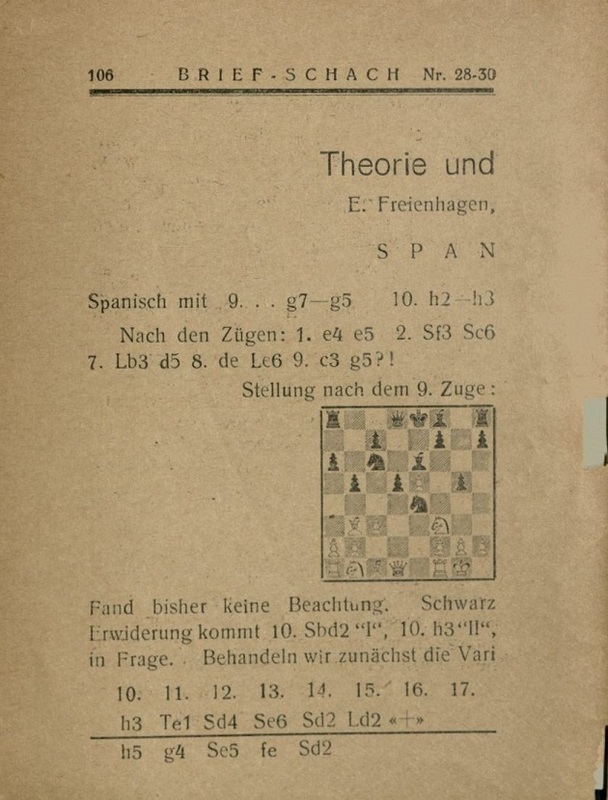 In CHESS, Tartakower stated that a telegram was sent to Buenos Aires, whereas his book had the phrase ‘contemplated sending ... a challenge to Buenos Aires’. 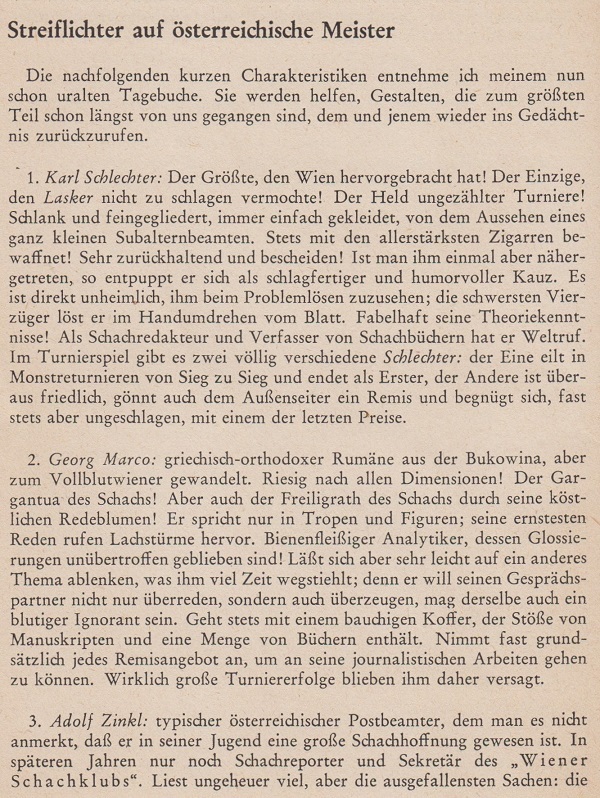 On page 270 of the French edition, Tartacover vous parle (Paris, 1953), the wording was ‘envisageait ... de lancer à Buenos-Aires un défi’. 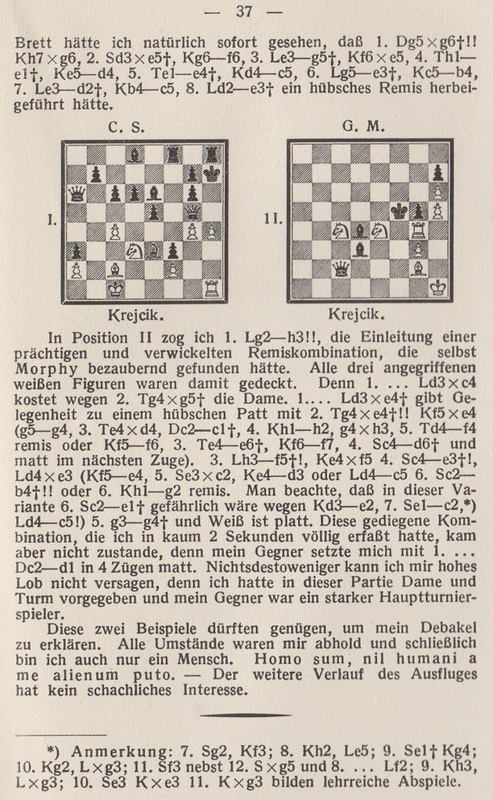 Regarding this position (a variation given by Tartakower and du Mont), C.N. 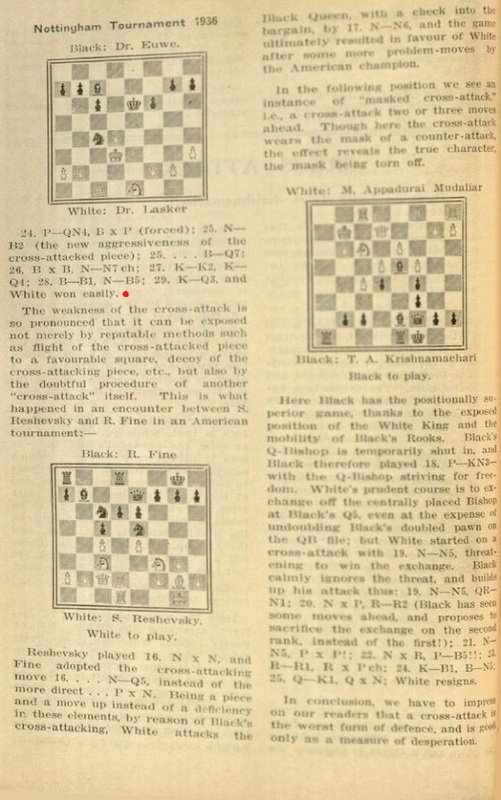 9519 showed Edgard Tchélébi’s observation on page 232 of Le secret de Morphy (Limoges, 1960) that White can play 14 Ne6 Qe8 15 Nc5+ dxc5 16 Nxf6+. 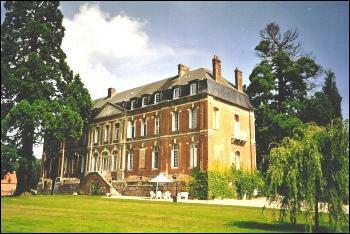 Bob Kane (London) notes another website at which accommodation in Alekhine’s château in St Aubin-le-Cauf can be booked. 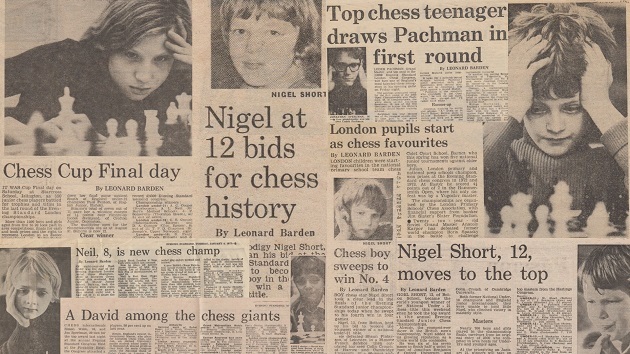 One photograph at the website is of a room with a chess set. 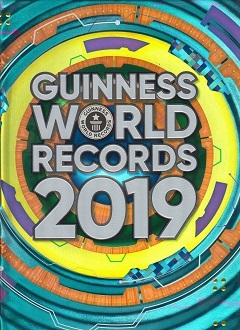 A photograph of Mr Turner’s head, virtually hidden by the attachments, takes up much of page 93 of Guinness World Records 2019 (London, 2018). 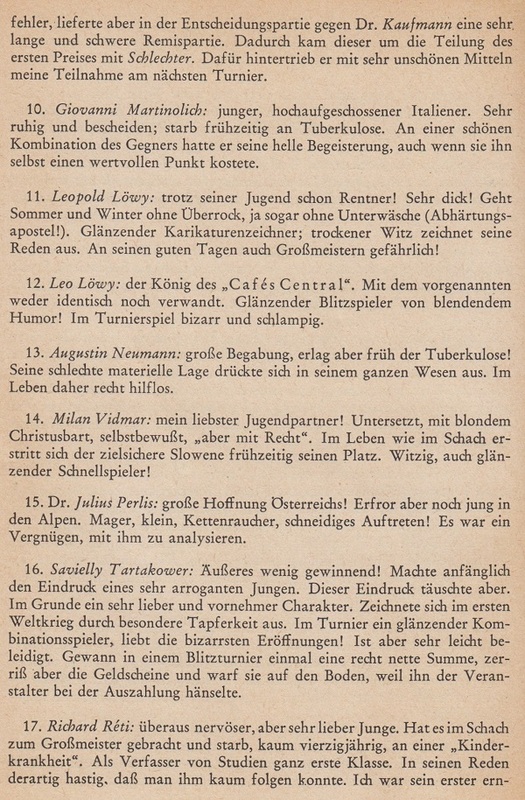 The book has scores, if not hundreds, of similar items, and especially in the gross ‘Food Feats’ section. 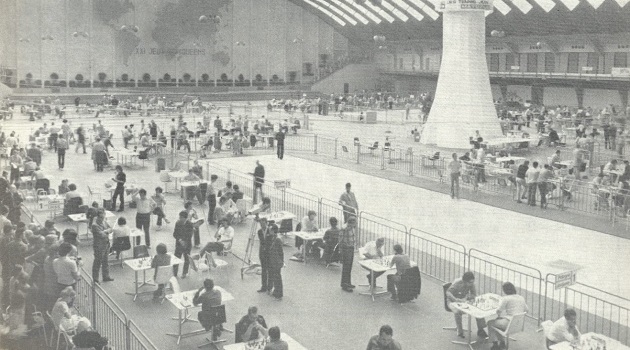 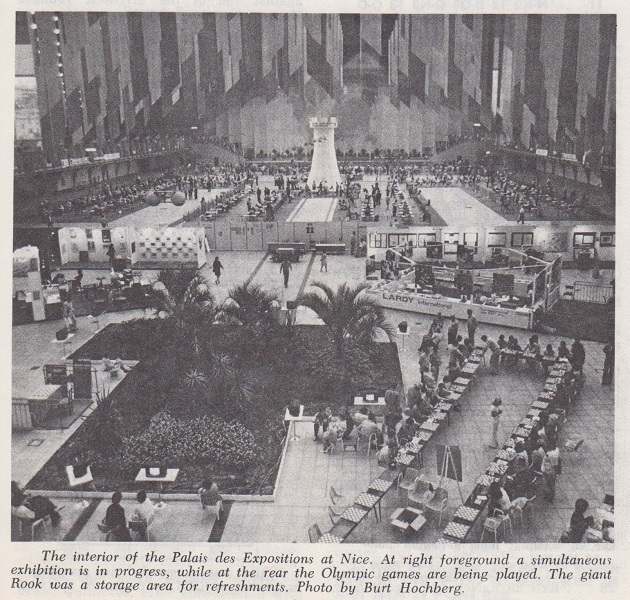 Following on from the latter item, we seek detailed information about the rook in the playing area of the 1974 Olympiad in Nice. 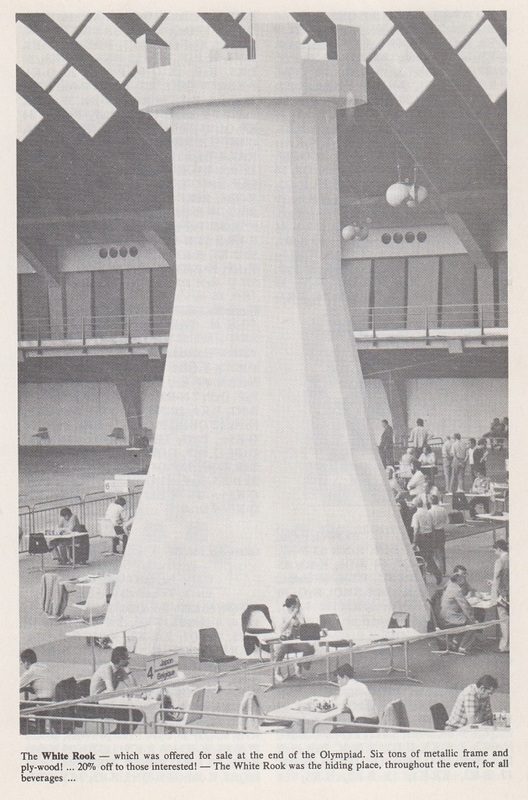 The photograph was also on page 155. 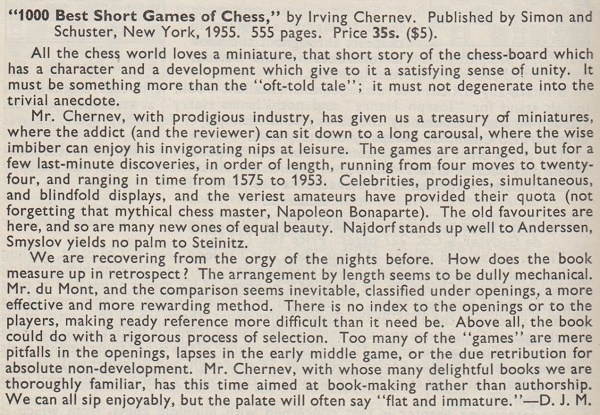 Chess Life & Review, October 1974, page 661. 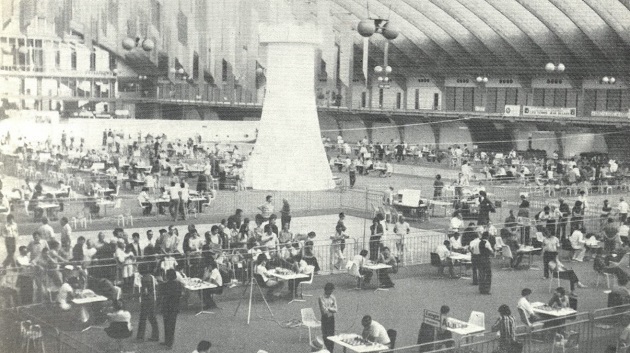 Major chess events often have, understandably, a logo (C.N. 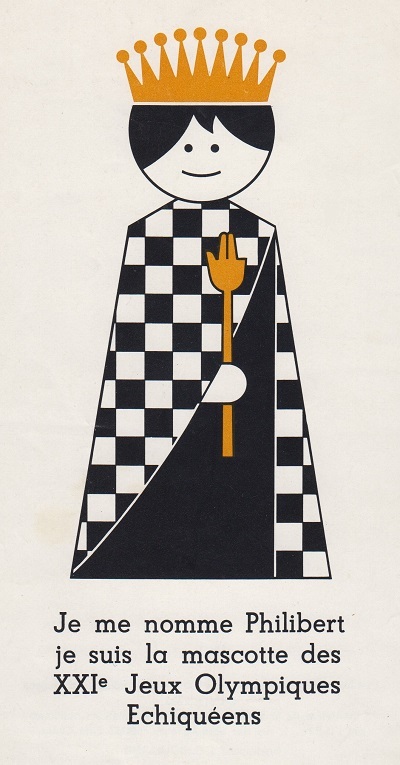 10672), but any possible reason for a mascot is hard to discern. 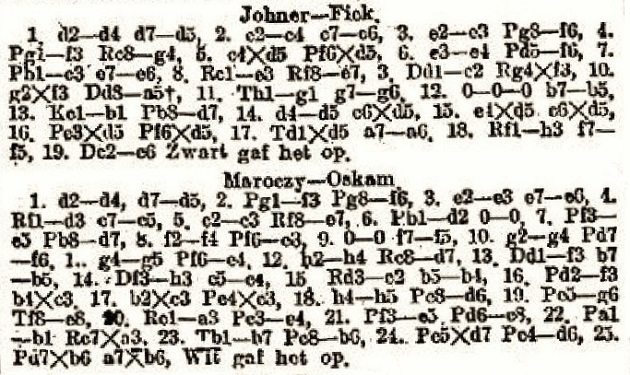 Noting that Emanuel Lasker was 67 when he defeated Euwe at Nottingham, 1936, José Carlos Santos (Porto, Portugal) asks whether any even older player has ever beaten a reigning world champion under standard tournament or match conditions. 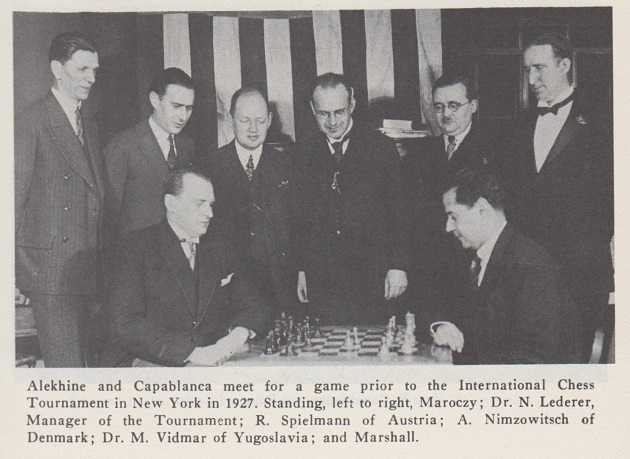 We add that Lasker’s famous win was discussed on pages 23-24 of the January 1937 Australasian Chess Review in an article by T.A. 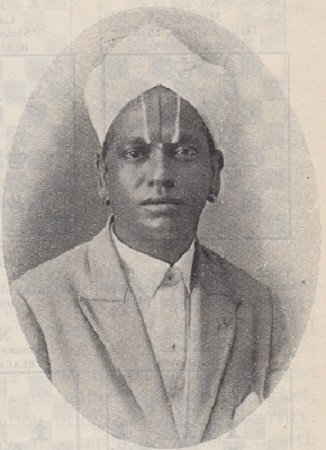 Krishnamachari. 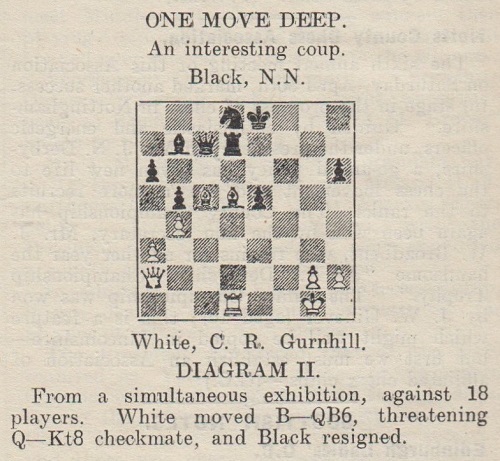 Its title, ‘Cross-Attack’, is a seldom-seen technical term. 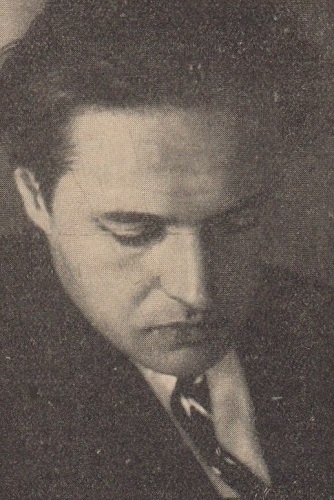 This photograph of T.A. 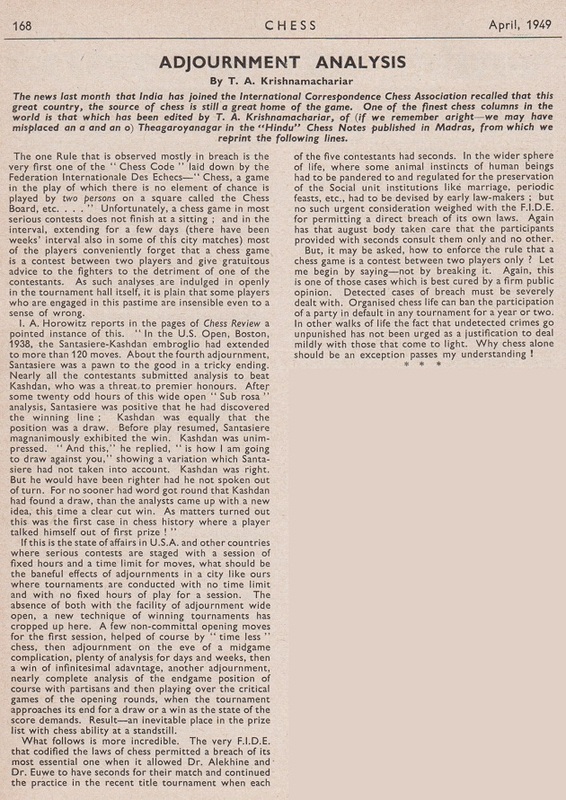 Krishnamachari (also: Krishnamachariar) is taken from an article about him by T.R. 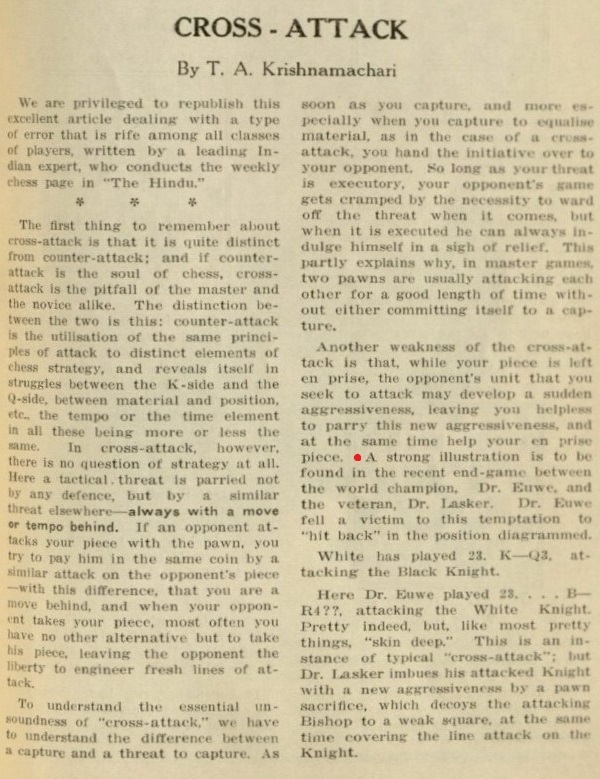 Dawson on pages 31-32 of the January 1940 BCM. 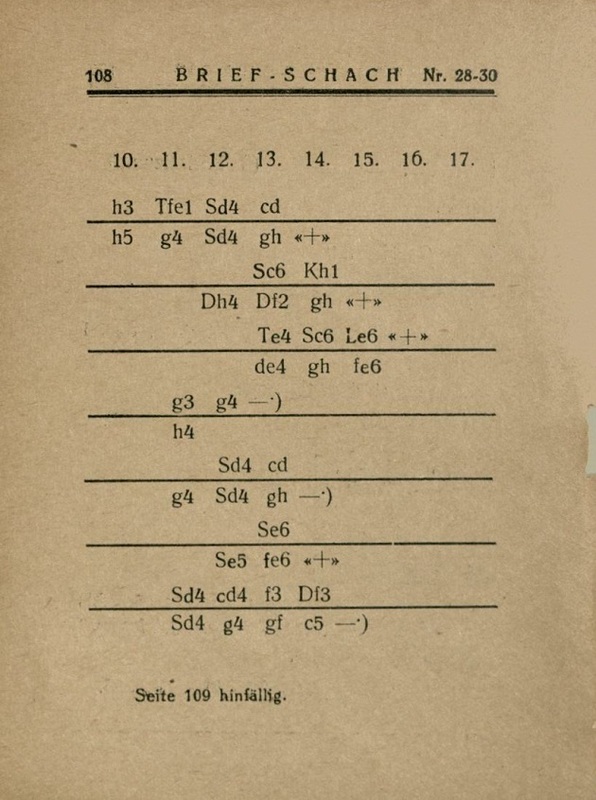 See too C.N. 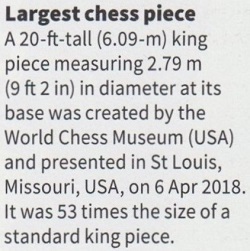 3391 on pages 220-221 of Chess Facts and Fables, and the entry on pages 214-215 of Indian Chess History 570 AD-2010 AD by Manuel Aaron and Vijay D. Pandit (Chennai, 2014). 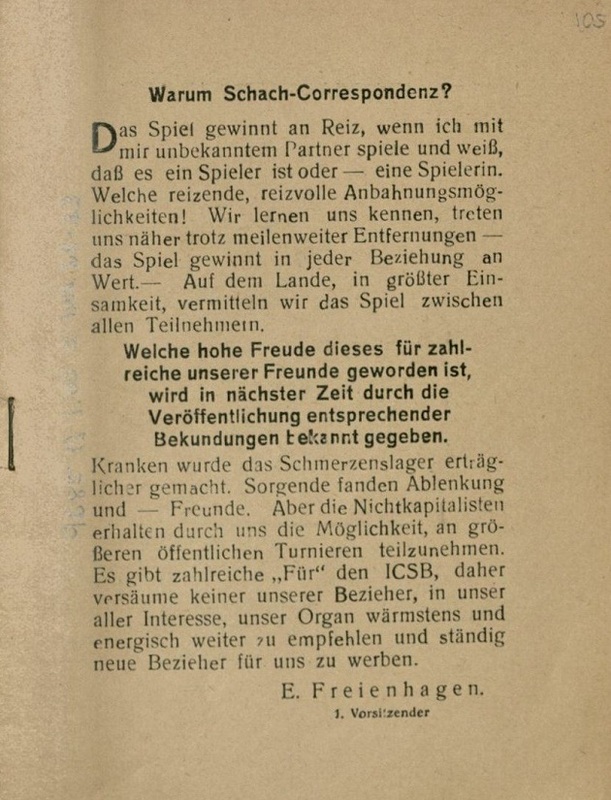 The phrase ‘meet for a game’ appears to be captionese, but is any more information available regarding the occasion? 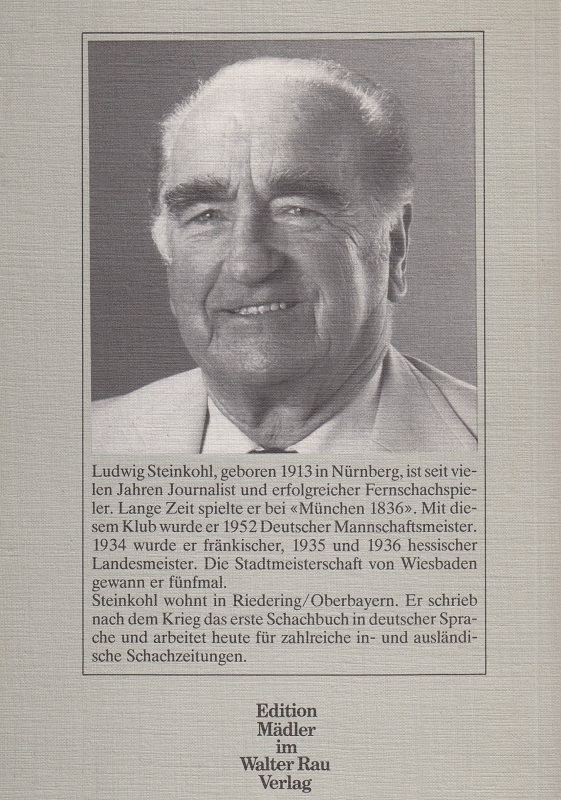 Page 127 specifies the source of the interview: Аргументы и факты, 50/2003 and 3/2004. 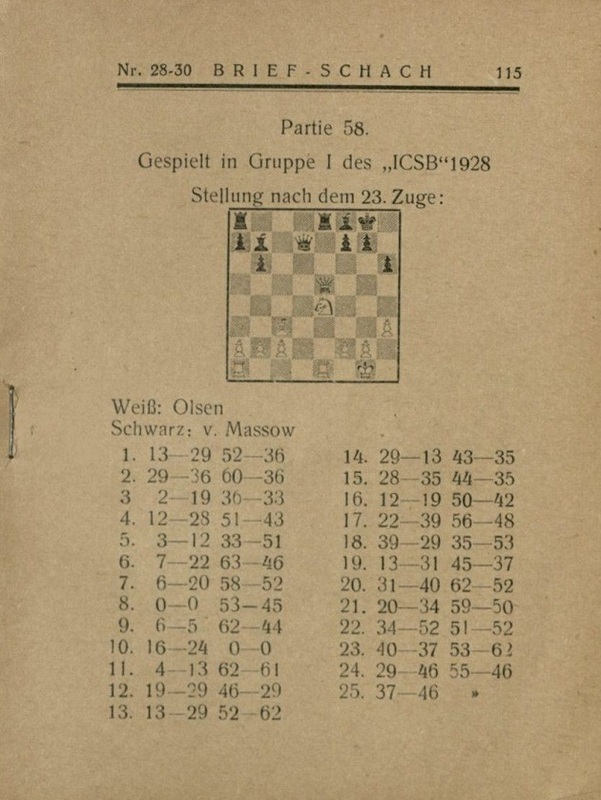 Have any corrected editions of Kasparov’s Predecessors series been published? 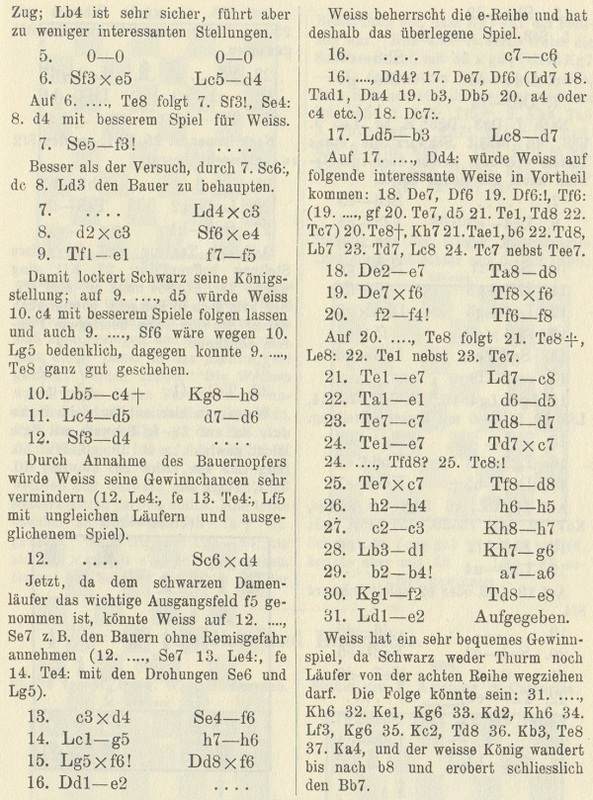 This illustration comes from pages 46-47 of the work mentioned in C.N. 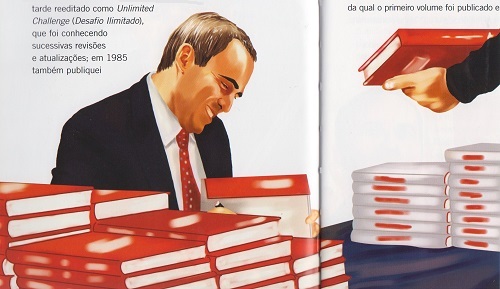 9839: Chamo-me ... Garry Kasparov (Lisbon, 2011), Me llamo ... Garri Kasparov (Badalona, 2013) and Em dic ... Garri Kasparov (Badalona, 2013). See our latest feature article. 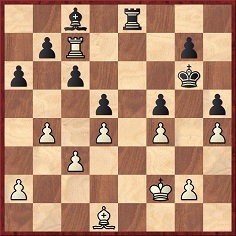 25 Rfe3 Bd4 26 Re7 Bxc3 27 bxc3 Qxe7 28 Rxe7 Kxe7 29 Qe4+ Kf8 30 Qb4+ Ke8 31 Qd4 Rd8 32 Qe3+ Kf8 33 h4 h5 34 Qxa7 Rh6 Drawn. 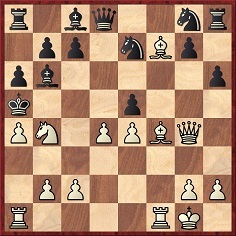 1 e4 e5 2 d4 d6 3 Nf3 Nc6 4 Bc4 Nf6 5 Ng5 d5 6 exd5 Nxd4 7 d6 Be6 8 Nxe6 Nxe6 9 Bxe6 fxe6 10 dxc7 Qxc7 11 O-O Be7 12 Nc3 O-O 13 Bg5 Rac8 14 Qe2 Nd5 15 Nxd5 exd5 16 Bxe7 Qxe7 17 Rad1 Rfd8 18 c3 Rc6 19 Rd3 Qf6 20 Rfd1 d4 21 cxd4 exd4 22 h3 Rcd6 23 Qe4 Drawn. 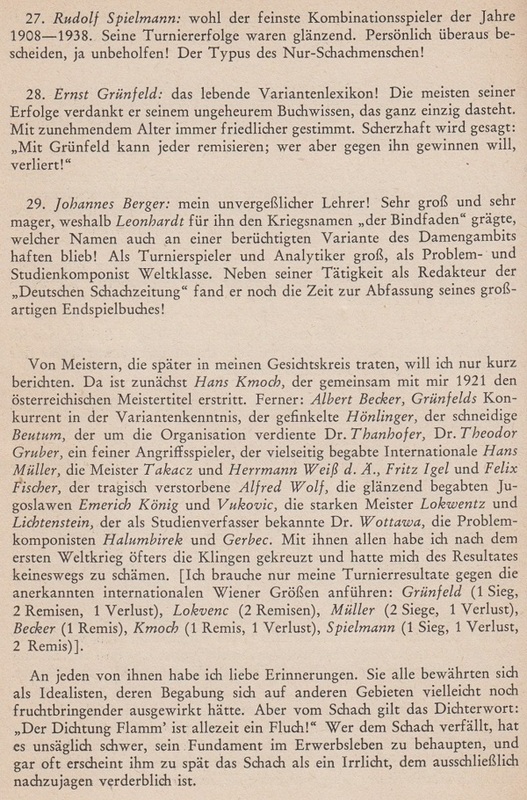 Below is the paragraph preceding the one in C.N. 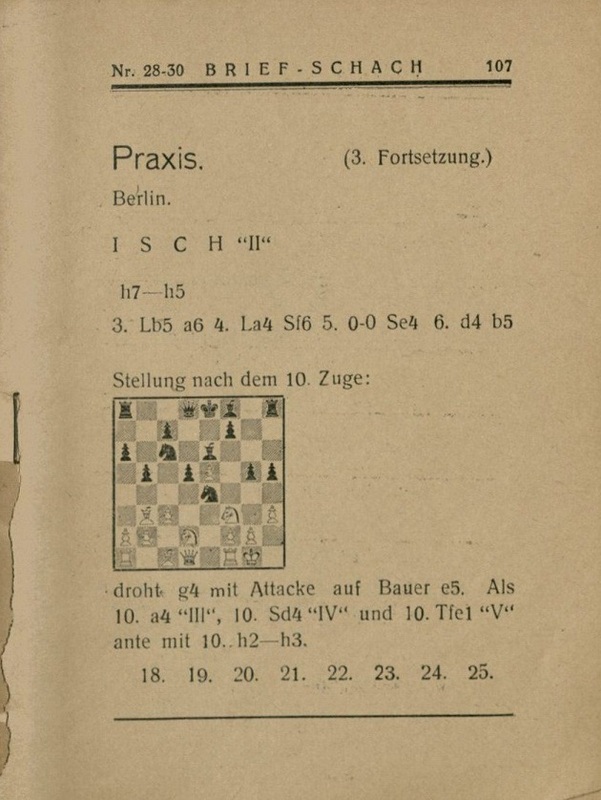 11031, from the 1951 Botvinnik v Bronstein match book by W. Winter and R.G. 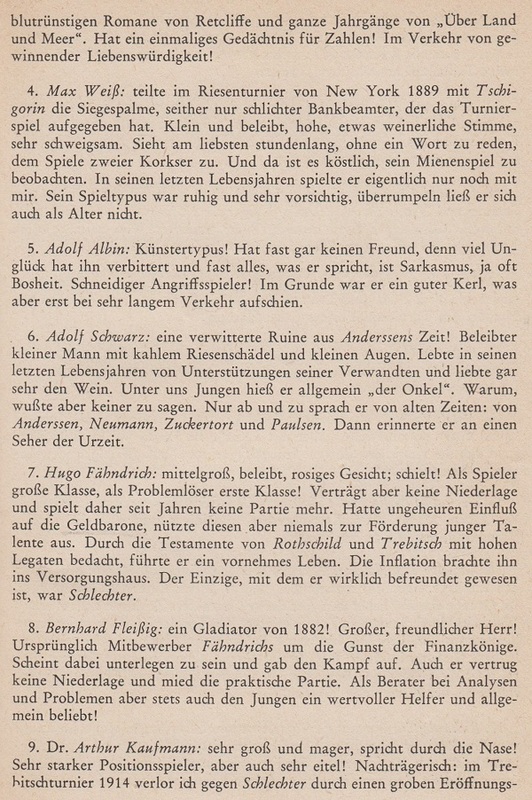 Wade, pages 32-33. 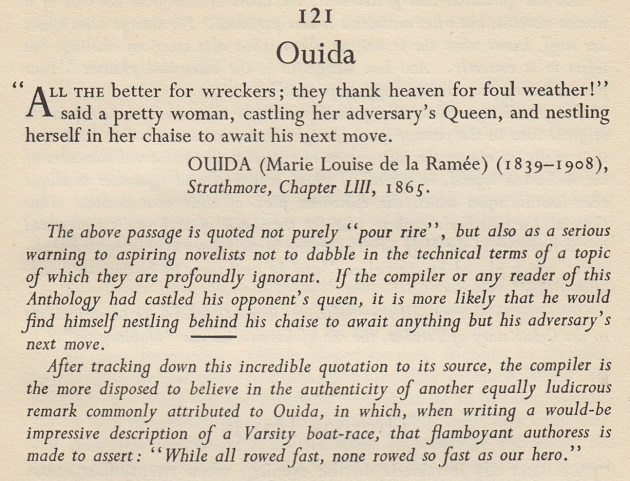 The writer is Wade. 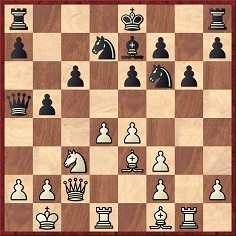 Bronstein did not play 44...e5, ...h5 or ...f4, but ...fxe4. 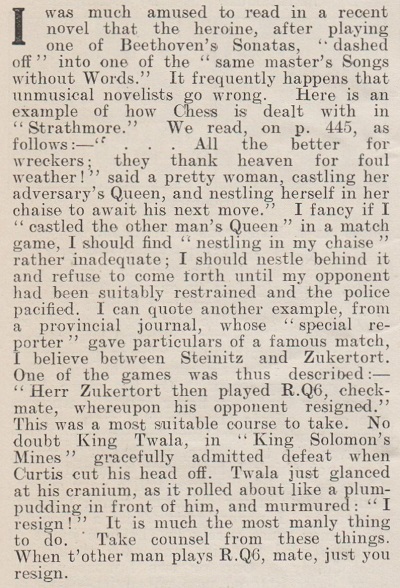 The book (page 129) had no analysis or comment at that point in the game. 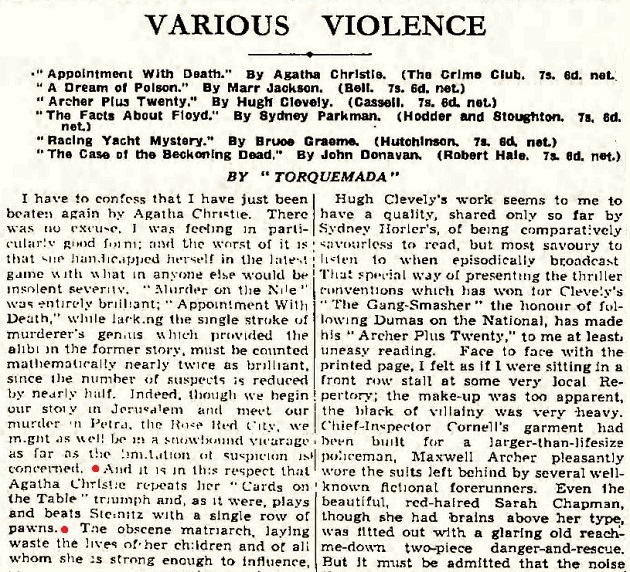 That review by ‘Torquemada’ of the Agatha Christie novel Appointment with Death comes from page 7 of the Observer, 1 May 1938. 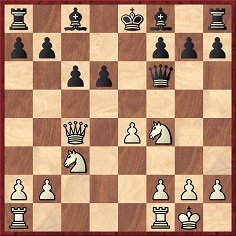 15 Nc6+ Nxc6 16 Bd2+ Nb4 17 Bxb4+ Kxb4 18 c3+ Ka5 19 b4 mate. 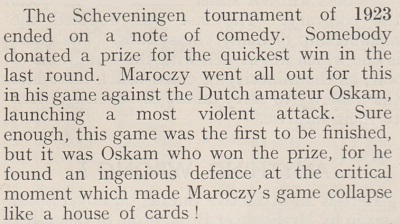 The only information about the game is that it ‘was given lately in La Vie Rennaise, we think, played in India’. 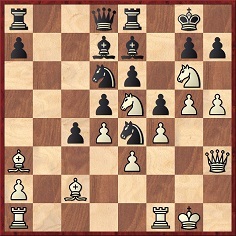 There is no record of many, or any, Chess Amateur readers being baffled by the position or asking why Black did not reply 1...Rxd1+. 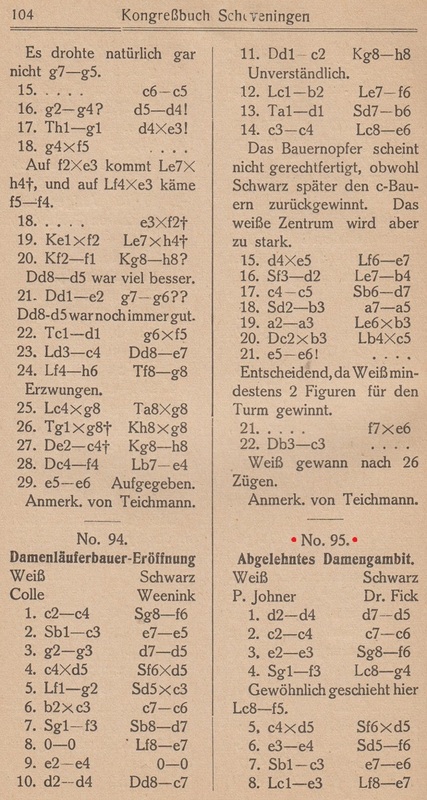 That takes up over half of one large page. 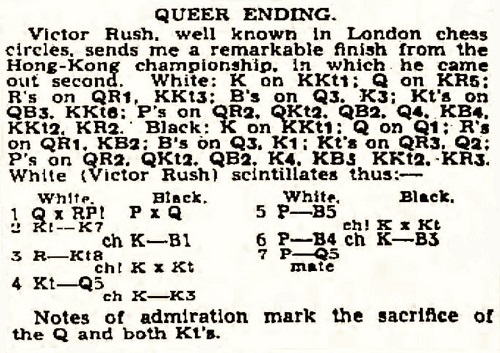 The same text was repeated on page 39 of Raymond Keene’s Complete Book of Beginning Chess (New York, 2003) and on pages 40-41 of the Las Vegas, 2018 edition.